MamaEatsClean: Sunny Sunday Week in Review - Busy Baking & Eating so where are all the recipes? Sunny Sunday Week in Review - Busy Baking & Eating so where are all the recipes? If you come here for Paleo, Low-carb or Candida recipes. Sorry they have been sparse lately. I have actually been cooking and baking up a storm but with my reduced posting days (Tuesdays, Fridays and Sundays) and my need to document recipes that my daughter likes ASAP, before they get lost, I seem to be posting more egg-free, gluten-free, dairy-free recipes than grain-free recipes. But as you will see in my week in review, I am still going strong with the Candida diet friendly experiments and I have lots of good grain free recipes coming. I was actually very excited about some of my experiments this week - a couple of great Candida diet friendly slow cooker recipes (I dusted that bad boy off in anticipation of my return to work), some new ways to use Vega One Protein Powder, two great dairy-free dips and two different successful waffle recipes - one egg-free and one grain-free. To name a few. If you are wondering if I have any hobbies other than cooking (and eating). I do. Lots. Lately, I would say I am slightly obsessed with second hand shops (i.e. where I scored my new "used" waffle maker and a second French Press for my office). I also love home decor and DIY'ing. I can actually be quite crafty for a numbers gal. So I decided to give you a glimpse into some of the other projects that go on in this house - outside of the kitchen. I love projects. Life would be so boring without projects. Until I hate them and can't wait for them to be over. Like my "pimp your closet" project that is 95% done and now I can't find the ambition to finish. Why do we have 50 socks with no match. What am I supposed to do with all my dancing clothes that I don't need but can't part with. Do I really need so many shoes (yes). As part of my "pimp my closet" initiative I decided I needed to find a better way to organize my earrings. They were all over the place and I can never find them when I need them. So I took a piece of artwork that I bought five years ago and never hung up (top right). I used my trusty staple and glue guns to cover it with a piece of mesh (i.e. a leftover piece of screen from some window that hubby had in the garage). 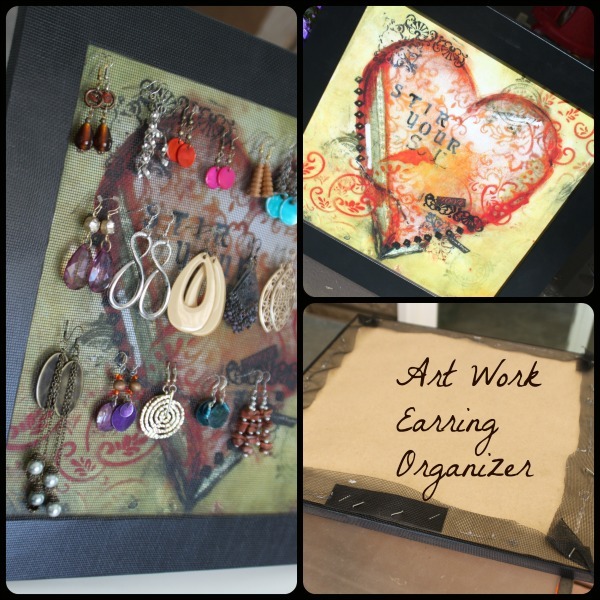 Voila - a pimped out way to hang all your earrings IN ONE SPOT. I think it looks awesome. And is so functional. Why did I feel the need to pimp my closet? It is officially one month until I return to work and my mornings need to get smoother. I am not excited about work and giving up this awesome lifestyle we have going but I am feeling much better about things. I finally got our daycare situation straightened out. I am putting the two youngest kids in a home daycare with a wonderful, energetic and caring mother. My 4 year old will have an instant best friend and they will be going to nursery school together. I feel as happy and settled about the decision as I'm going to get. Part of me is mourning that we weren't able to find a nanny (and that anyone other than me will be spending the day with my little ones) but I actually think this is for the best. So time to move on and start getting things organized. That includes making notes for our new daycare provider on what my kids do and don't eat. I'm already on page 3 and I feel like I haven't scratched the surface. It is going to be very difficult for me to hand over control of feeding my kids to someone else. How do you explain in a short but clear way what it means for us to eat clean. But do it in a gentle and practical way so she doesn't want to fire us in the first week. I'll let you know when I figure it out. Its going to be tricky but I'm determined that I didn't, and don't, spent so much of my mental energy and time moving mountains to get us all eating real, whole food to let someone else feed my kids processed food. But it is hard because that's the standard out there. I'm asking for something special and frankly a lot more work. Luckily she is very open and seems eager to learn about this clean eating business so hopefully we get to a comfortable spot for both of us. So I'm planning for Fall to start and life to change. Which is driving me to finish up some projects around the house. Get organized. And learn some new "working mom friendly" meals that are still MamaEatsClean compliant. Enter the slow cooker and waffle maker. As always, I didn't document our whole week. Lots of "picnic" style dinners and lunches were had at the park which I don't document. But here are some highlights of things we ate at home, where the camera was on hand, and I didn't feel I was spoiling a family moment by taking pictures of my food............................hope it inspires you to keep or start eating clean! If you are on the Candida diet and can't eat pork here is a good sausage option for you. It is a turkey sausage that is nitrate free and they are a reasonable price - $4.99 for this pack. So far the only place I have seen these is Sobeye's. I'm not sure if they are 100% clean - I don't know every ingredient on the label and I only have so much time but they are close enough and I need options. I can usually find nitrate free or turkey but not both at the same time. They also have bratwurst, mild Italian and breakfast sausages. And they are good. And the kids like them. This was a "gluten free" pizza I made for my daughter with "rice" cheese on top. She actually liked it. I had to use Chia gel in lieu of eggs. Frankly, I didn't think it was stellar but she ate the whole thing over a couple of meals so who am I to complain - I can't eat it anyway. Salad for lunch. Topped with boiled egg and leftover turkey sausages. We had a little early Birthday celebration for my daughter and her friend at the park. I was responsible for the chicken fingers. I modified my Paleo Chicken Fingers recipe by replacing the egg wash with full fat coconut milk to make it egg freee. It worked like a charm. The kids loved them. The breading (almond flour, ground flax and coconut flour) stuck well and browned up nicely. I'll be making these again. I also had to bring a dessert. I was trying to make black bean brownie cake pops (and I did) but they were not cooperating so I made these as a back up. A marshmallow dipped in dark chocolate. Not very clean. But I'm not perfect. A new slow-cooker recipe coming soon. I wanted a beef stew but you can't have any root vegetables on the Candida diet. So I made a beef stew with a Mexican twist that was Candida diet friendly: black beans, green chiles, onions, peppers, spices. I served it on a bed of cabbage slaw and topped with fresh avocado. It was tasty and the meat was very tender. I'll be making this again when I go back to work. A brownie I made with beet puree and buckwheat flour for my daughter. Per hubby it tasted like beets. It looked quite good but the girls didn't love it so we won't be having it again. Another cake - this one for me. I used the rest of the beet puree in this blueberry slice. It was good. It was also weird that it was bright pink when I put it in the oven and came out white when it was done. Magic. I would have shown the kids the before and after if I had known that was going to happen. Another salad. More sausages. More egg. My new "ranch" dressing recipe. I'm pretty pumped about this. I was never getting the creaminess that I wanted in my Candida diet friendly dressings. I will try and post this recipe soon but basically I pureed sunflower and hemp seeds in with coconut milk and spices to get this dressing. Yum. 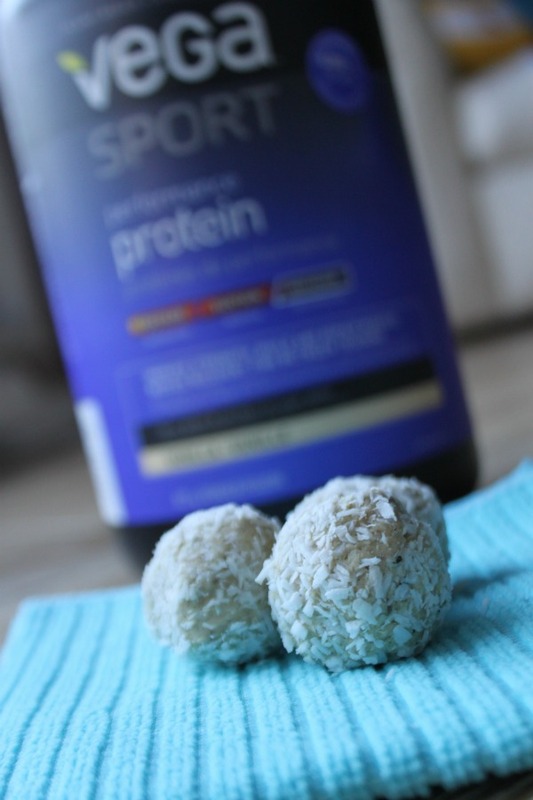 Creamy with no dairy or eggs. My blueberry beet cake. I sweetened it with Xylitol to keep it Candida diet friendly. It was quite good. My "almost" finished closet. Or part of it. 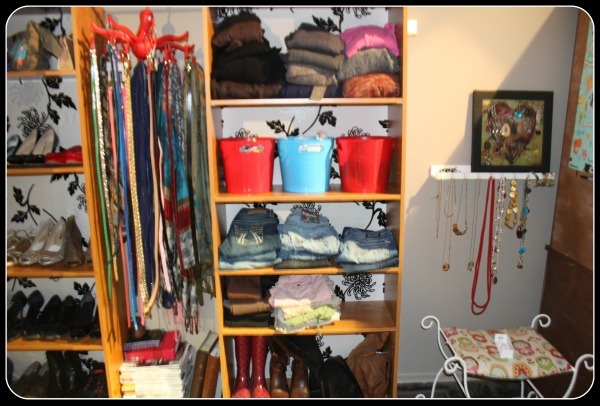 I used one of those Ikea drying racks for all my belts and scarves (that weird red octopus looking thing). Some fabric on the back of some cheap old bookcases. And my new jewelry organizer. I put my new earring artwork up on an Ikea Ribba ledge that I put some hooks on front of for my necklaces. Yep - those long red beads are from my Ukrainian dancing days. Why are they still taking up prime real estate in my closet? I need to let go. That's also a stool I refinished a way back that my neighbor was throwing out. I spray painted it white and covered it with nesting doll fabric. I love nesting dolls. I love staple guns. This whole project cost me $5.99 since I just moved furniture and re-used things from around the house. Another project I finally finished. Baby's room finally got a bit of a sprucing up this week. He slept with me for 8 months and then it was summer so I hadn't decorated his room. I picked up that cute mid-century stool at the thrift store for $3. I used $9 worth of fabric to cover it and make a no-sew valence (pinking shears and some Steam-to-Sew tape). It took me way longer to pick out the fabric than it did to make these two items. I think they look cute. I will eventually give his room a proper makeover when he's ready to move to a bed. I made more black bean brownies this week. Can't stop. Addicted. 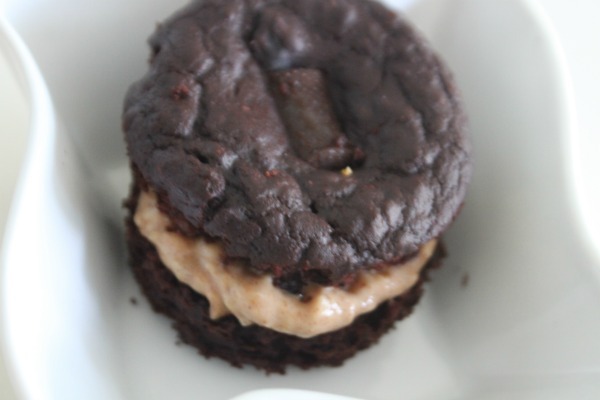 This one with some kind of nut butter/coconut milk/Stevia icing in the middle. 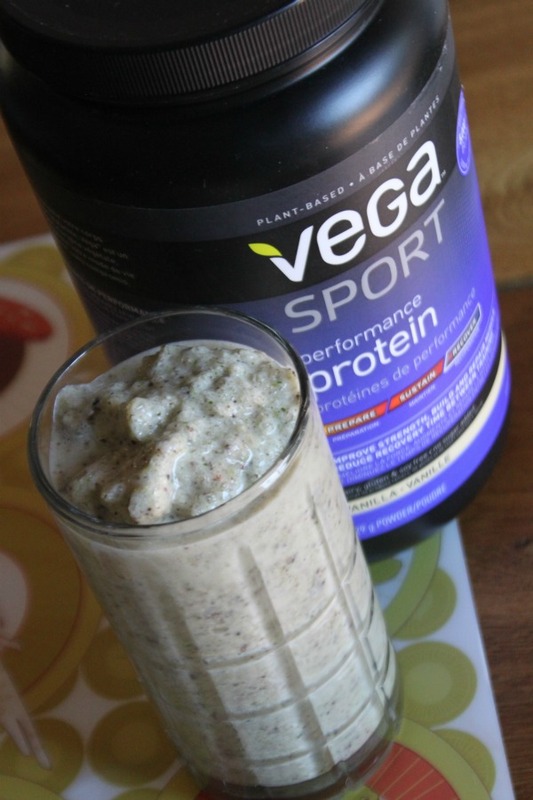 I'm kind of in love with Vega One Sport Vanilla - I didn't like the Vanilla flavour in the all-in-one - 3 serving of veggies in it tastes like 3 serving of veggies. But I love it in the Sport. A few recipes to come. It is a good Vegan, Stevia sweetened Protein powder if you are looking for one and don't know where to start. By far the cheapest you will get it in Winnipeg is Popeye's supplements. Watch your prices - it is very expensive at the health and major grocery stores. 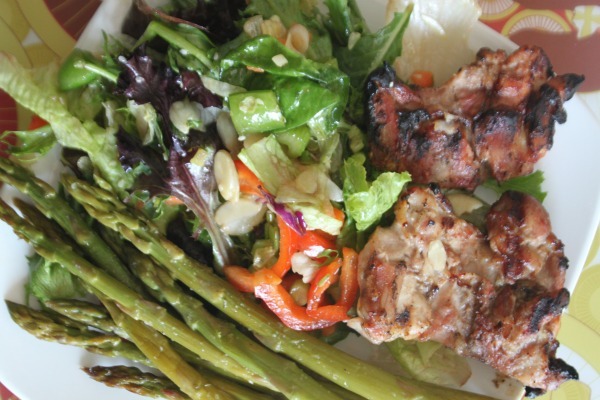 Grilled Chicken Thighs. Asian Salad. Asparagus. Good. Clean. Food. My new $4 waffle maker WORKS LIKE A CHARM. I'm kinda in love with it. 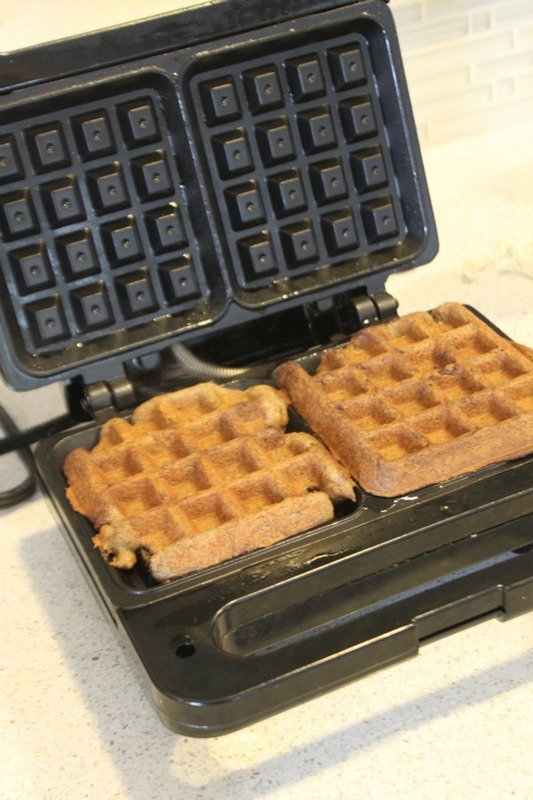 Many batches of waffles were made and experimented with this week. Recipes will be coming. Did I mention I LOVE thrift stores. 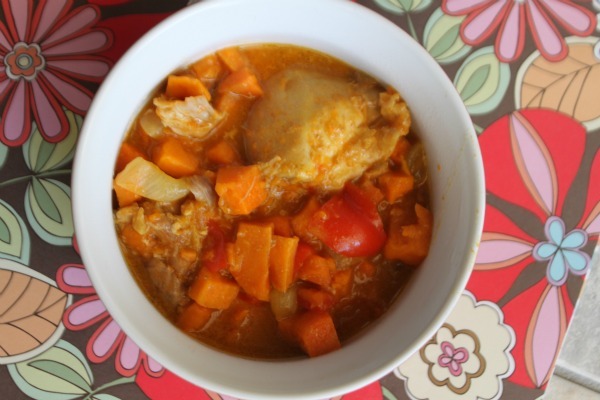 Slow cooker recipe alert - chicken thighs, sweet potato, pepper, curry, coconut milk. Yum. Quick. Easy. Recipe in the works. I made three batches of Vega One Vanilla protein balls - one lemon, one chocolate, one maple walnut. All deli-sh. Recipes pending. This was a delicious pumpkin slice. I got this recipe from the Detoxinista website (click here). I modified it to make it Candida diet friendly by using Xylitol as the sweetener. Seriously, this was an easy recipe. I'm going to play with it a bit to jazz it up and see what other flavor combinations I can come up with. But this was good as is. Totally grain-free. Yay! So that's my week in food. Well, some of it. I had a bad Candida flare this week. I'm not winning that battle. But I'm still trying. Not sure why its not going away. Three months now. Yes - I cheat a bit but not that much. I don't know what it is going to take. But I'm not giving up. I've got to get rid of it because I HATE the roller coaster its putting me on. I have good days and bad. Good hours and bad. So wish me luck...........in getting organized, eating clean, fighting Candida and most importantly enjoying summer. Because its too short! Do you have the recipe for the Mexican beef stew over cabbage slaw? Thanks!